January 5: Marjorie delivers First Wednesday’s Lecture for Vermont Humanities Council. Newport, VT.
March 27: April 22: Marjorie does Music and Writing Residency; Vermont Studio Center. Johnson, VT.
May 12: Water Music concert, featuring readings and photographs from the book Water Music and a performance of Handel’s “Water Music” and Telemann’s “Water Music.” Events are part of the show: “Water: The Exhibition.” The Royal Ontario Museum, Toronto, Canada. May 23: Marjorie gives national plenary address for NACC annual conference. Milwaukee, WI. April 14: Osher Lecture on Water Music for the University of Vermont, held at Aldrich Library in Barre, Vt.
May 5: First Wednesdays' lecture, Vermont Humanities Council, Fletcher Free Library, Burlington, VT.
July 28: Three Poets, in Pie and Poetry event: David Budbill, Geof Hewitt and Marjorie Ryerson. Brookfield Town Hall. July 29: Art show of Marjorie's water photos at Vermont Natural Resources Council's annual meeting and lecture by Maude Barlow. June 3: First Wednesdays' lecture for Vermont Humanities Council. Marjorie lectures in Montpelier at the Kellogg Hubbard Library. July 12: Water Music concert with pianist Michael Arnowitt. St. Paul's Cathedral, Burlington. Part of Quadricentennial Celebration of Lake Champlain. October 7: First Wednesdays' lecture for Vt. Humanities Council, Rutland, Vt.
December 5: Cover to Cover: Vermont Authors presentation. Randolph, Vt.
Student members of the Hopewell Valley Youth Chorale viewing Marjorie's show at The Pennington School, in Pennington, NJ. Photos by William M. Alford, Chair of the Arts Department of the school. February-March 2008: Marjorie and Vermont photographer Annie Tiberio Cameronjoint held a joint art show of their water photographs at Restaurant Phoebe, on State Street in Montpelier, Vt.
April 2, 2008: As author of Companions for the Passage, Marjorie gave a lecture on being present at the death of friends and loved ones. The lecture was part of the "First Wednesdays" speakers series for the Vermont Humanities Council. Brooks Memorial Library, Brattleboro, Vermont. April 14-15, 2008: Marjorie participated in three Earth Day concerts with the world-class Portland Symphony Orchestra, in Portland, Maine. The concerts were assembled by guest conductor Ankush Bahl with the assistance and inspiration of the executive director of the Portland Symphony, Ari Solotoff. October 6-10, 2008: Water Week at Randolph Elementary School, as Randolph joins other Vermont schools in a celebration called the Year of Water. Marjorie taught all grade levels during the week. The kindergartners took a pledge to protect water for the rest of their lives. The first graders made "earth necklaces" with one special, hand-crafted bead representing the Earth's only fresh water. Other students made posters representing the number of gallons needed to produce food. For example, it takes between 800-1300 gallons of water to make one hamburger.Filmmaker Joe DeFelice came and filmed the opening assembly. Composer and Water Music musician Mary Elizabeth attended the final Friday assembly, where the children sang her song that they had learned, "There is Only One Water." More details of the Year of Water can be found under News and Events on this web site..
One Randolph student brings his water art project up to the front of the room in the final assembly. 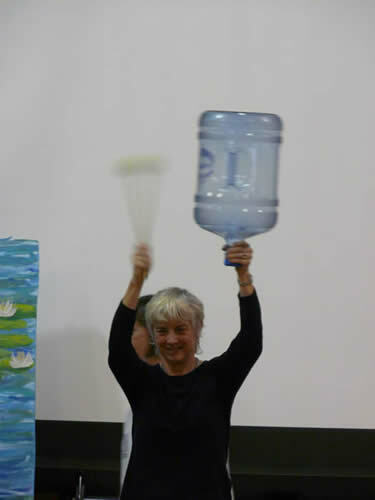 Marjorie beats the water drum to start the Friday water assembly at Randolph Elementary School. Photograph by Mary Elizabeth (c) 2008. Composer Mary Elizabeth talks to Randolph students about her piece, "There is Only One Water." Principal Shirley Stewart addresses the final water assembly of Randolph's Water Week. January 3, 2007: Marjorie was the speaker for the Vermont Humanities Councils' "First Wednesdays" lectures. St. Johnsbury, Vt.
January 6 2007: Marjorie talked about water with students at the Campbell Park Elementary and Marine Studies School in St. Petersburg, Florida. Marjorie meets with Campbell Park Elementary School marine-studies students in Florida. Photograph by Edward Lincoln (c) 2007. January to April 2007: Opening reception (January 6th) and a three-month art show of Water Music photographs were part of the Pier Aquarium's Celebration of Water in St. Petersburg, FL. Show included local crafts, written commitments to help water by local residents, and 40 of Marjorie's water photographs. Marjorie (left) joins viewers as they tour her photo show at St. Petersburg's Pier Aquarium, part of the Pier's major three-month Celebration of Water from January to April, 2007. Photograph by Edward Lincoln (c) 2007. March 1, 2007: Marjorie lectured at Central Vermont Hospital's monthly medical meeting. Noon to one. March 8, 2007: As this year's Visiting Scholar at Green Mt. College in Poultney, Vt., Marjorie gave a reading of her poetry and non-fiction and lectured about the Water Music project. March 22, 2007: World Water Day--Water Music Concert with Marjorie, pianist Michael Arnowitt and two-time Grammy award winner (and Water Music musician) Native-American flute player Mary Youngblood. The Mahaffey Theater, St. Petersburg, Florida. The Water Music Concert followed a lecture by water expert and author Sandra Postel and an international video panel discussion by water experts from several parts of the world. The entire evening's events were transmitted in a live broadcast to listeners in seventy countries and forty-eight states. Dr. Noel Brown, president of the Friends of the United Nations, thanks performers Marjorie, Mary Youngblood and Michael Arnowitt at the conclusion of their March 22, 2007 World Water Day concert at the Mahaffey Theater in St. Petersburg. Photo by Mary Sturdevant. April 1 - May 15, 2007: Marjorie's water art photography show was on display at the University of Southern Maine. Seventh Floor, Glickman Library, USM, Portland, Maine. April 19, 2007: Marjorie gave a Water Music multi-disciplinary presentation and lecture at the University of Southern Maine in Portland, to accompany her Water Music art show at the same university. 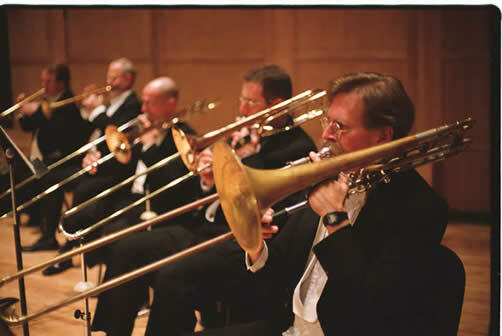 The evening's events included a performance by professional musicians from the Portland region. April 27, 2007: Live interview and call in show of Marjorie was conducted by Seattle radio host Andrew Schorr on his show Patient Power. The show played nation wide and is now archived on line. September 20, 2007: Lecture and slide show about Water Music given by Marjorie to the members of the Center for Photographic Studies, Montpelier, VT; 7:00-8:30 p.m.
January 4, 2006: Marjorie's lecture on her new book, Companions for the Passage, took place at Middlebury's Porter Hospital. 4:00-5:30. January 6, 2006: The Boston Symphony Orchestra performed Tan Dun's "Water Concerto," about which he wrote an essay for Water Music. 8:00 p.m. Symphony Hall in downtown Boston. January 11, 2006: Video conference call between Water Music team and the UNESCO-IHE Institute of Water Education in Delft, The Netherlands, to initiate the IHE-Water Music global merger of forces over water issues. 8:00 — 10:00 a.m.
January 25, 2006: Awards Ceremony for Water Music project, hosted by New England Water Environment Association at the Copley Plaza Hotel in Boston. Mid-day. February 2, 2006: Marjorie was the featured speaker for the Professional Women Photographers Association: Pratt Institute's Second Floor Conference Room: 6:15 p.m.- 9 p.m.; 144 West 14th Street, (between 6th & 7th Avenues) NY, NY. March 1, 2006: Book signing, Barnes and Noble, Burlington, Vt., hosted Marjorie and her new book Companions for the Passage. 7 p.m.
March 8, 2006: Marjorie and Michael Arnowitt performed a Water Music Concert at Johnson State College, Johnson, Vermont. Dibden Auditorium. 8:00 p.m.
April 8, 2006: Chandler Music Hall in Randolph, Vt. hosted a "French Impressions" tour concert by classical pianist Angela Jia Kim. Kim's concert featured music from French composers and included Maurice Ravel's Jeau d'eau. Marjorie's water images were projected on the back of the stage during the Ravel. April 12, 2006: Marjorie interviewed by Judy Simpson on the CBS affiliate station WCAX-TV. The 15 minute interview, on that day's "Across the Fence," show, was about Companions for the Passage. Noon. May 4, 2006: Marjorie lectured to the Literature and Medicine class at Central Vermont Hospital about her book Companions for the Passage. 5:00-7:30. May 5, 2006: Marjorie's water photos were on display at the ECHO-Leahy Center to accompany an evening of live music by several Burlington-area bands, including the Gordon Stone Trio and Bubblin' Upstream, a University of Vermont based-band that works to promote the arts and awareness around environmental issues. The evening's focus was water. Other visual artists displaying at the event included Jim Sardonis, Emily Marie Graves, Hilary Glass, Hayden Boska and Lizzie Post. Burlington, VT. 6 p.m. to midnight. May 6, 2006: Author's talk (1:00) about Water Music and opening reception (2:00) for six-week-long art show of Marjorie's water photos. Ryan Books, Johnson, Vt. 1:00-4:00. May 16, 2006: Marjorie joined other Vermont authors at the Vermont Library Conference at the Sheraton in Burlington, Vt. 6:00-8:00 p.m.
May 23, 2006: Marjorie gave lecture on her new book, Companions for the Passage as part of the "Literature and Medicine" class being run by the Vermont Humanities Council at Rutland Regional Hospital. 5:00-6:30. Open to the public. June 4, 2006: Marjorie was a guest on host Jean Feraca's hour-long National Public Radio show, "Here on Earth: Radio Without Borders," 4:00 p.m. EST. Joining Marjorie and Jean on the show was Peter Gleick, director of the Pacific Institute in Oakland, CA and Azzam Alwash, an Iraqi-born engineer and environmental activist who is working to restore the wetlands at the base of the Tigris and Euphrates Rivers in Iraq. July 17, 2006: FAME ("Fabulous Art Monday Evenings") Water Music talk by Marjorie at the Woodstock Artists Association Gallery, Woodstock, NY. September 5, 2006: Marjorie was interviewed about Water Music, Inc. by "And So It Flows" radio host Leslie Gabriel. Show aired on Great Barrington, MA radio station WBCR from 9:30-9:50 a.m.
October 5, 2006: Water Music presentation--talk and slide show--at Vermont Environmental Consortium's annual meeting, Norwich University, Northfield, Vt.
November 6-10, 2006: St. Hilda's & St. Hugh's School in New York City held a major "Water Week." All grades of the school studied water from across all academic disciplines during the week, and Marjorie served as teacher and guest of honor throughout. In every single hour of the entire week, St. Hilda's & St. Hugh's students and teachers accomplished a vast, in-depth, multi-disciplinary study of water. Academic activities included studies of water in the fields of music, art, science, religion, English, history, physical education, math, Latin, French, Mandarin Chinese and all the other disciplines taught in this exceptional Upper West Side school, and also included the school's students in nursery school and junior and senior kindergarten. The sounds of waves, rushing rivers, rain, and water-inspired music filled the school lobby every day on the PA system; posters and art works and sculpture inspired by water decorated the walls and halls. One art class built a bathtub-sized, multi-tiered water fountain that will soon be on display inside the school's front doors. 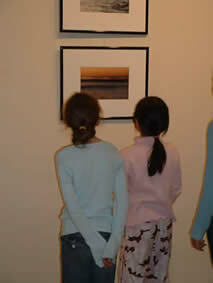 Below are photographs from the week by artist and art teacher Mary Ann Holiday and school photographer Jonathan Goti. As quickly as you came, you left, drained out and gone. You had seeped in on Monday. And water surfaced in our consciousness. It ran in and out of the curriculum. We heard it cry for respect. We learned how we had harmed it. We saw beauty that we had been too busy to notice. We learned how lucky we are. We played. Then you were gone, back to where you came from. Like the damp sands of the receding tide, we hold the memory. Water will never be the same. It has a face. It has a mood. It can be hurt. It can rejoice. While you were here we rejoiced in it. we promise we will take it with us in our hearts. November 7, 2006: Morningside Books hosted Marjorie in an author's presentation for Water Music, 7:00-8:00. Morningside Books is at 2915 Broadway, New York, NY 10025; (212) 222-3350. November 15, 2006: Marjorie was the keynote speaker for Addison County Hospice Volunteer Services at its annual meeting. A book signing, organized by Vermont Bookshop, followed. Middlebury Congregational Church, Middlebury, VT, 7:15-9:00 p.m.
Feb. 14, 2005: Dartmouth College's celebration of water's lyrical influence brought the Water Music project to Dartmouth College. In her presentation, Marjorie was joined Jody Diamond's Gamelan group. Environmental Studies Chair Andrew Friedland provided introductory remarks, and Sarah Allan from the Department of Asian and Middle Eastern Languages Department spoke on the philosophical implications of water. The event was co-sponsored by the Film and Television Studies and Environmental Studies Programs. Faulkner Auditorium, 4:00-5:30 p.m. Hanover, NH. March 19, 2005: Opening Reception for Water Music Art Show at The Chandler Gallery for the Arts, Randolph, VT. 5:00-7:00 p.m. Show dates: March 19 to April 10. March 24, 2005: Marjorie presented lecture and PowerPoint presentation from Water Music at the celebration of the Vermont Environmental Law Center's 25th Anniversary: "Living la Vida Local"; Music by guitarist Jeff Staudinger. Vermont Law School, South Royalton, VT. 7:30-8:30 p.m.
April 2, 2005: Water Music concert featured Marjorie and pianist Michael Arnowitt. Portion of the ticket price was donated to the Water Music Fund of the United Nations Foundation. 7:30 p.m. Chandler Center for the Arts, Randolph, VT.
April 16, 2005: Marjorie presented Water Music at the Open House for Dandelion Acres in Bethel, VT.
May 22, 2005: Marjorie presented a Water Music celebration and concert, with pianist Michael Arnowitt, at the Opening Ceremony of River Network's national River Rally. The Lodge Ballroom, Keystone Resort, Keystone, CO.
June 27, 2005: Marjorie was the dinner speaker for the Vermont chapter of the Women's International League of Peace and Freedom's Women and Water campaign. The national WILPF has made the issue of women and water one of its two major campaigns for the next three years. Rochester, VT, 7 p.m.
Sept. 21 to Oct. 15, 2005: A show of Marjorie's water photos was on display in Burlington College's Community Room gallery. Sept. 21, 2005: Marjorie was one of four presenters in a month-long lecture series presented by Burlington College's Institute of Civic Engagement, in Burlington, Vt. The month-long series of Wednesday night public lectures and events is called "Water: Conflict and Cooperation." Marjorie presented "Water Music: A Tribute to the Inspiration and Magic of Water" in the college's Community Room from 6:30-9:15. The evening was presented in association with the Vermont-Israel-Arab Peace Partners Project. A reception for Marjorie's art show at Burlington College was held from 4:30-6:00 on the 21st. Oct. 5, 2005: Marjorie sold copies of her book Water Music at the Global Water Symposium at St. Michael's College, prior to and following a lecture by environmentalist Lester Brown. Water Music introduction writer, musician Paul Winter, will perform at the same event. Lester Browns talk free and open to the public. His lecture on the global water crisis begins at 8:00 p.m.
Oct. 8, 2005: An evening reception for the opening of an art show of Marjorie's water photos, including new work, was held at the Sleeper House Gallery in Stowe, Vt. The reception, open to the public, was from 5:00-7:00. October 25, 2005: Marjorie discussed her Water Music project with students and staff in the main auditorium at the UNESCO-IHE Institute for Water Education at 19:30 p.m.. She and pianist Michael Arnowitt performed an hour's Water Music concert. Delft, The Netherlands..
October, 26 2005: Marjorie and pianist Michael Arnowitt performed a Water Music concert at 19:30 p.m. in the Van der Mandele Hall in Delft, The Netherlands. The concert was sponsored by the UNESCO-IHE Institute for Water Education. It was followed by a reception given by the Lord Mayor of Delft in his 13th century office building. October 28, 2005: Marjorie and Michael Arnowitt performed a Water Music concert in Germany at the International School of Düsseldorf. The concert was at 19:30. 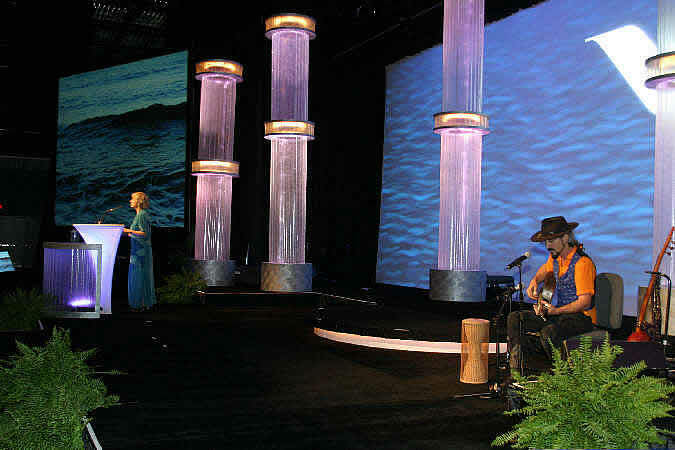 November 1, 2005: Marjorie received the 2005 Harry E. Schlenz Medal for her work with Water Music. This international award was given to Marjorie in the Washington DC Convention Center, at 5:15 p.m.
Jan. 17, 2004: Water Music musician Brad Mehldau performed at the Flynn Center for the Performing Arts, Burlington, VT.
Jan. 26, 2004: Ceremony in Boston, MA where the 2004 Paul Keough Award was given to Marjorie. It is a New England-wide award for leadership in the water environment, given to a person who has significantly raised public awareness about water issues. 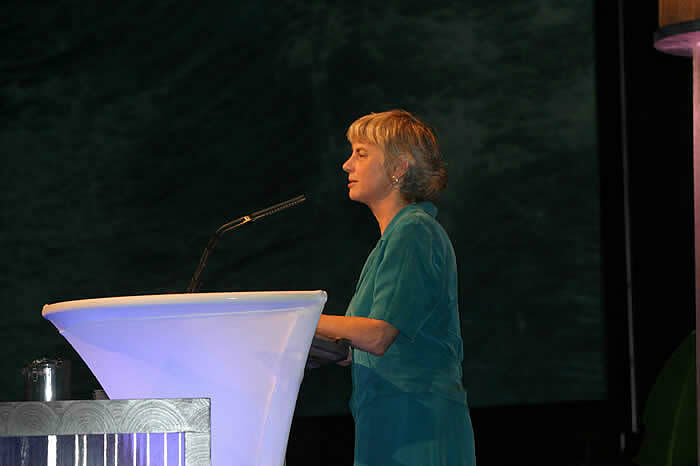 Marjorie was also nominated for the international award, the Harry E. Schlenz Medal. The Schlenz Medal is presented to "an outstanding individual for his or her contribution and dedicated services to the Water Environment Association and to the water environment profession." Feb. 2, 2004: Book King in Rutland, VT; Author presentation, reading and book signing, 7 p.m.
Feb. 12 — Mar. 13, 2004: Show of the paintings of water by artist Fredericka Foster at the Fischbach Gallery at 210 Eleventh Avenue, NY, NY. Ms. Foster has volunteered to contribute 10 percent of the sale of all of her water paintings to the Water Music Fund at the United Nations Foundation and to further the work of the Water Music Project. April 5, 2004: Interview of Marjorie by Public Television's "Profiles" show with host Fran Stoddard. Show first aired at 7:30 p.m. and then played twice again later in the same week. May 13-16, 2004: Marjorie served for the 14th year in a row on the staff of Middlebury College's New England Young Writers' Conference at the Bread Loaf campus in Ripton, VT, as a teacher of poetry. She gave a poetry reading of her own poems during the conference. Throughout the conference, Water Music was on sale in the Bread Loaf bookstore. May 22, 2004: Water Music Concert in Cabot, Vermont featured Marjorie and classical and jazz pianist Michael Arnowitt. The pianist played music from around the world, inspired by water and Marjorie read from the book. This concert, sponsored by the Cabot Public Library, was the first in an international series of concerts that Michael and Marjorie are doing. September 29, 2004: Marjorie gave lecture on the making of her Water Music project at Beloit College, Beloit, WI. 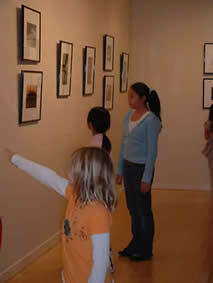 November 2004: Six-week-long show of Water Music photos at the Mariposa Art Gallery in Peterborough, NH. A reception, talk by the artist and book signing was held Nov. 5. September 2003: Water Music released by the University of Michigan Press. Sept. 11, 2003: Interview of author on WCAX-TV (the CBS affiliate in Vermont) morning news show, Burlington, VT.
Sept. 16, 2003: The Marcus Roberts Trio played free concert at Castleton State College, Castleton, VT, to celebrate the release of Water Music. Roberts is one of the Water Music musicians. 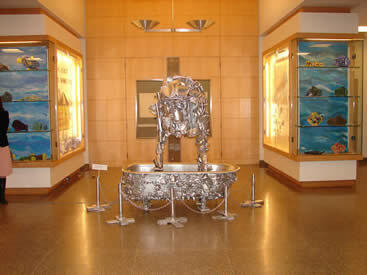 Sept. 22, 2003: Launch Party for Water Music at the United Nations, 5 p.m.-7 p.m. (Reception by invitation only). Nearly one-third of the book musicians attended this party, along with 140 guests. Keynote speaker for the event was Dr. Noel J. Brown, former director of the Environment Programme for the United Nations. September through November 2003: An art show of Marjorie's Water Music photos was held at the Interfaith Center of New York City, 40 East 30th Street. Sept. 25, 2003: Live interview with radio host Barbara DeMarco on 88.9 FM KUCI in Orange County, California, 8:30 EST. DeMarco is on the Web at www.kuci.org. Oct. 2, 2003: Water Music musician Mark O'Connor performed at the Flynn Center for the Performing Arts, Burlington, VT, 8 p.m.
Oct. 2, 2003: Marjorie served as a panelist for "A Sense of Place and The Call to Act: In defense and witness of the natural world." The panel was presented by the Flynn Center for the Performing Arts in Burlington, VT.
Oct. 5, 2003: Ryerson interviewed about Water Music by Vermont Public Radio host Neal Charnoff. The interview played at 5:50 during National Public Radio's "All Things Considered" show. Oct. 6, 2003: Live radio interview on WDEV-FM from Waterbury, VT. Ryerson was guest of radio host Mark Johnson, 9 a.m.
Oct. 7, 2003: Live radio interview on WGDR-FM with host Joseph Gainza, Plainfield, VT, 9 — 10 a.m.
Oct. 7, 2003: Water Music presentation at Bear Pond Books, 77 Main Street, Montpelier, VT, 7 p.m. Store is packed; standing room only. Oct. 29, 2003: "Author's Supper Series" for Water Music at The Three Stallion Inn in Randolph, VT. Sold-out dinner and reading sponsored by Cover to Cover Bookstore, the Kimball Public Library and the Three Stallion Inn, all of Randolph. Nov. 2, 2003: Afternoon Water Music Salon, with live music, at the Interfaith Center of New York City, 40 E. 30th St., New York, NY. The Salon featured Marjorie, Paul Winter, Jane Ira Bloom, Carol Maillard and Mary Elizabeth. All the musicians donated their services for this event. The Salon was a joint fundraiser for the Water Music Fund of the United Nations Foundation and the Interfaith Center. An elegant brunch was served. 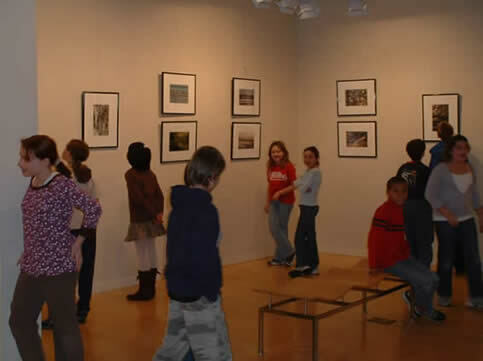 Nov. 8, 2003: Water Music three-month-long art show opened in the Amy E. Tarrant Gallery of the Flynn Center for the Performing Arts in Burlington, VT. The show was up until January 1, 2004. Nov. 15, 2003: 70-minute Interview on Vermont Public Radio's "Interlude" show, with host Peter Fox Smith. Marjorie talked about Water Music and Smith played music by book musicians, all of it music inspired by water. Smith has invited Marjorie to return to his show to discuss the project at a later date. Nov. 15, 2003: Book signing and talk at Barnes & Noble in Burlington, VT. 3:30 p.m.
Nov. 16, 2003: Reception for Marjorie's Water Music art show at the Amy E. Tarrant Gallery at the Flynn Center for the Arts', 153 Main Street in Burlington, VT. 4-7 p.m. Sweet Honey In The Rock attended the reception. Nov. 16, 2003: Water Music musician Carol Maillard performs with her group Sweet Honey In The Rock at the Flynn Center for the Performing Arts, Burlington, VT.
Nov. 19, 2003: Reading/book signing at Norwich Bookstore, Norwich, VT, 7 p.m.
Dec. 6, 2003: Book signing at Dartmouth Bookstore, Hanover, NH, 11:30 a.m.-1 p.m.
Dec. 13, 2003: Book signing at Sun of the Heart Bookstore in Bridgewater, VT. 12:00-2:00.